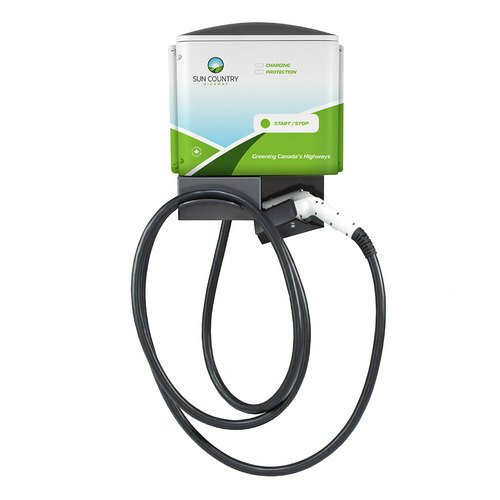 The SCH40 provides fast charge times for electric vehicles and commercial fleet vehicles with 32A, 7.7kW of continuous charging power. Rugged (NEMA 4) weatherproof casing and easy to read charging panel. Built-in smart re-closure system that self-tests, resets, and ensures your car will be charged in case of power fault or outage. The Universal J1772 connector ensures maximum electric vehicle compatibility.Unit comes with a 22 ft (6.8 m) cord set. Competitively priced hardware upgrade solutions available for remote monitoring communications and electronic payment processing. Can be wall or pedestal mounted. Meets cUL and UL listing safety standards. *Pedestal sold separately.